Dhaka to Cox’s Bazar flight is a recent inclusion for internal and domestic flight service. Now, tourists can easily save valuable time by boarding on the air. It takes only an hour to reach Cox’s Bazar from Dhaka by Air. Now there are several airline operators are available who provide service for the passengers. Especially the rich and the businessmen are the regular customers for airlines. Sometimes, common people visit Cox’s Bazar by air fulfill their dreams. The article is all about Dhaka to Cox’s Bazar flight schedule and air ticket price. You can get all biman service information from a single place. Biman Bangladesh Airlines has daily schedule except Tuesday to operate flights to the Cox’s Bazar and vice versa. The departure time from Dhaka is 8:35 AM and arrival time at Cox’s Bazar is 9:35 Am. On the contrary, the departure time from Dhaka is 10:00 AM and arrival time at Cox’s Bazar is 11:00 Am. Dhaka to Cox's Bazar air ticket price for Biman Bangladesh Airlines is TK 5500 for Super Saver, TK 6000 for Economy Saver and TK 6500 for Economy Flexible. The ticket price may vary on the account of time and availability of seats. Novo Air is a new company to operate flights to Dhaka to Cox’s Bazar route. Dhaka to Cox's Bazar flight schedule for Novo Air is that one flight is for every day. Another Novo Air flight is also for every day except Monday and Wednesday. The airfare to Dhaka to Cox’s Bazar and vice versa is TK 5500, TK 7300 and TK 8400 for Special, Discounted, and Flexible respectively. The departure time from Dhaka is 11:30 AM and 2:30 PM and the arrival time at Cox’s Bazar is 12:25 PM and 3:25 PM respectively. Also, the departure time from Cox’s Bazar is 12:55 AM and 15:55 Pm and the arrival time at Dhaka is 13:50 PM and 4:50 PM respectively. 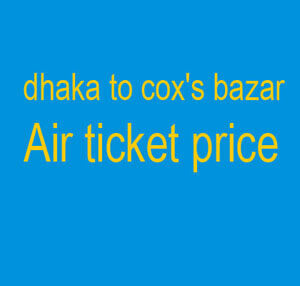 Dhaka to Cox’s Bazar air ticket for United Airways has different categories with a different price. Many people go to the tourism city Cox’s Bazar along by air along with road side. So, it is important to know Dhaka to Cox’s Bazar flight schedule. Traveling on air can save your times though it is costly. You can get all information by visiting the office of the airlines. You can also buy a ticket from the official website of the airline companies. You Can Chose using Dhaka to Cox'sBazar Bus Service. Be remember that, domestic travel by air requires no passport.